N.B. There is a discussion and preview thread about SMF Terminal B here. From San Francisco or Lake Tahoe, use I-80 to I-5 northbound (Woodland and Seattle). From Stockton use I-5 (or US 99 connecting to I-5 via I-80 westbound) northbound. From I-5 north the airport is 10 miles "southbound" (east) of Woodland. 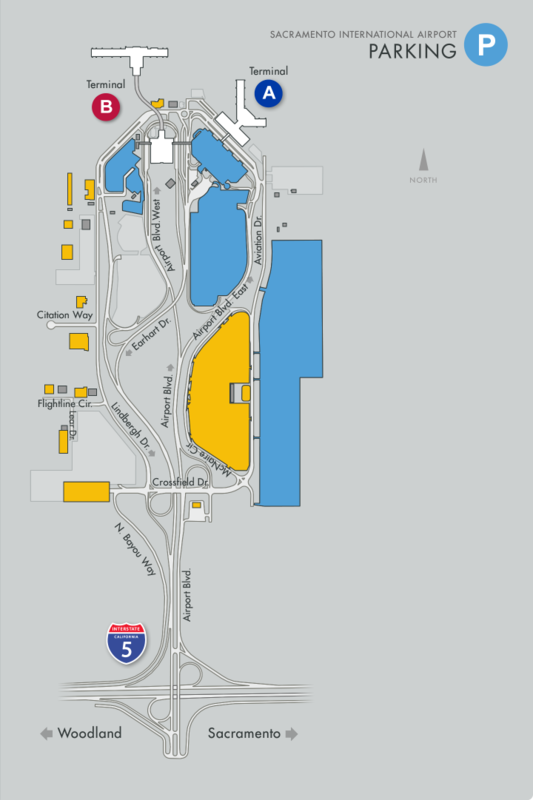 The airport is 0.5 miles north of the Interstate 5 on Airport Boulevard. GETTING TO AND FROM TERMINAL "A"
Follow signage and keep to Airport Boulevard East - a one way multi-lane road running counterclockwise will take you to an area you can stop and drop off or pick up passengers. Parking or stopping for any length of time to wait is prohibited; the Sheriffs are quite quick to get you to move on. A free cellular / mobile phone lot at the airport entry, west side, is the best place to stop to wait for arriving passengers to call drivers. GETTING TO AND FROM TERMINAL "B"
Folow signage and keep to Airport Boulevard West - the new terminal includes a two level roadway, running clockwise. The upper level is for departures and the lower level serves arriving passengers and baggage claim. Passengers departing or arriving on Southwest will find it easiest to use the West side; those using all other airlines will find it easier using the East side. Courtesy shuttle busses travel four routes: between terminals, to parking lots (daily and economy are separate) and to the rental car center. These are all accessible. One can walk or use a wheelchair between terminals, which are connected via the parking garage - but note that though the garage has a ceiling, it is not enclosed fully. Currently, there are Priority lines at SMF - Terminal A; at Terminal B it is on your far left, separate from the non-priority queue entries. There are now TSA PreCheck queues at both SMF terminals (October 17 2013); the SMF website does offer indications of how long it is taking to transit security. -In the middle are two lines: PreCheck, which splits off to the left, and general boarding, which splits off to the right. -Along the far right wall is the Premier/First Class/Business Select/etc line. For international arrivals there are now Global Entry kiosks. Parking varies considerably, from the parking garage to "economy" lots; best thing for current information is to visit the SMF parking map and click on the appropriate garage / lot number for current rates. "Cell phone lot" / waiting area: This area offers free parking for a short period of time for occupied vehicles whose occupants are waiting for passengers, who can call them when they arrive. This allows comfortable waiting within five minutes of any terminal, without causing congestion (and inviting a ticket from the officers patrolling the arrivals area, where waiting is not permitted). Yolo County Transportation District's Yolobus offers two routes, 42A (clockwise) and 42B (counterclockwise) that connect SMF to Sacramento, Davis and Woodland (clockwise) and the reverse. Service is approximately hourly beginning at 5:24 AM and ending at 10:22 PM at SMF. PDF schedules etc. here, and fares and passes information is here. These also offer the option of connecting with AMTRAK's California Capitol services to the SF Bay area at the Davis or Sacramento AMTRAK stations. Check here and here for California Capitol schedules, ticket prices, etc. N.B. Sacramento Regional Transit does not serve Sacramento International Airport. There is an ARCO station near the entrance to the airport, #22 on the map, to top up your rental vehicle. Several hotels do provide complimentary shuttle services to / from SMF airport. "The Sacramento County Sheriff’s Department, Airport Division manages the lost and found program at Sacramento International Airport. Please visit the Lost & Found Web page to report your lost item. Please call (916) 874.0701 and leave a detailed message concerning your lost object. The Sheriffs frequently listen to these messages and will return your call if they have the object. If the item has been lost on board an aircraft, please contact your airline directly." "Paging is managed by the Sacramento International Airport Communications Center. Please call (916) 929.5411 and press the appropriate prompt key to reach the operator." WiFi / Wireless Internet - FlySacramento is the net name you should use. You will be required to watch a brief advert for free WiFi. "Sacramento International Airport has free wireless Internet (WiFi) service throughout the indoor, public areas of the airport. SMF’s Wi-Fi network has 4 T1 connection, which provides users with speeds of up to 1.5 Mbps. The Wi-Fi 802.11b/g technology allows for speeds up to 54 Mbps, but throughput is governed by the speed at which the device is connected." Please use SMF Flight Search to find nonstop and direct flights to your destination or return. I think the First/Business Select line is on the right. Pre on the left, general in the middle, First on the right. Either that or First and Pre are next to each other on the left. I'm 99% sure there is a First/BS dedicated line somewhere. Also if you dont mind, please report back as to how your experience going through the airport in a wheelchair goes. It'd be a great data point for future travelers. Their offer: Bring us an international flight –nonstop across the Atlantic – and we’ll let you fly rent-free out of California’s capital for two years. Oh, I hope SMF gets some nonstop European flights! was also covered by KCRA this past week. Gotta start somewhere but TATL on an LCC isn't particularly interesting to me. I've flown FI Saga Class. I'd take that for the convenience alone. For the 7 hour flight to KEF, the cabin experience is acceptable to me. YMMV. Apologies if this has already been covered ... Is SMF a realistic airport choice if my final destination is Walnut Creek? Last time through SFO it took me 4 hours to get to Walnut Creek (bad timing - gridlock from SFO to the east end of the Caldecott). Walnut Creek is about 2 hours from SMF, yes? Yes it's 2 hours generally speaking but I-80 can also have a lot of traffic through Vacaville, Fairfield, at certain times of day. So, it depends heavily on the time of day you need to drive to/from the airport. OAK is the closest airport, you just pop over the hills on CA-24 and you're pretty much there. SJC is viable also depending on the time of day. Since it looks like you fly AA, I'd just book into OAK via PHX if it is a viable connection for you. If you'll be arriving during the afternoon commute then consider SMF, but otherwise I would use OAK as my first choice. If you're arriving Sunday afternoon/evening don't even think about SMF. No traffic SMF-WC is about 1hr 10min; OAK-WC is about 35 min. I would fly OAK without a second thought. For WC, I'd also cut across Oakland to go up the hill (up 98th Ave. or Hegenberger Road - both turn into other streets) to 580 to 13 to 24. For WC, I'd also cut across Oakland to go up the hill (up 98th Ave. or Hegenberger Road - both turn into other streets) to 580 to 13 to 24. Airport Lounges coming to SMF? The bids would be evaluated and results published in June 2018. The lounge operator would have to pay development of at least $350/sq ft at least $40/sq ft in refurbishment after five years as well as unspecified rent. I wonder if we might actually see, for example, The Escape lounges at SMF, as there is at OAK? Nice bonus for AMEX Platinum members, etc. Would make a lot of sense given the significant growth in passenger counts the airport has seen in the past 24 months or so.